A new, refreshed edition of the five-level English course for teenagers, with a clear structure, supported approach to speaking, practice, and exam preparation still at its heart. Solutions has been thoroughly modernized with 80% new content to drawin students, embed the grammar and vocabulary presented, and engage them in the tasks. Its guided approach builds up every student´s confidence, through step-by-step objectives, lots of practice, meaningful personalization activities, and exam preparation tasks. The course now embraces a wide range of teaching methods, furnishing the teacher with a flexible pick-and-choose package for use in the classroom, at home, and on the move. The digital elements of the course enliven the material and allow teachers to vary the pace and focus of their lessons. Solutions turns all students into active learners, by offering a rich variety of learning opportunities for a whole range of abilities through extension and revision activities in all components - giving everyone a sense of achievement whatever their level. 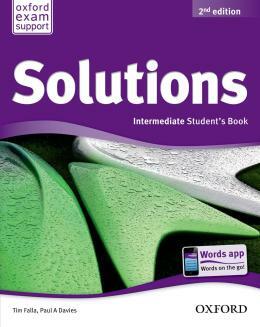 The Solutions Second Edition DVD-ROM material and worksheets bring the language to life by taking it out of the classroom and into authentic settings.